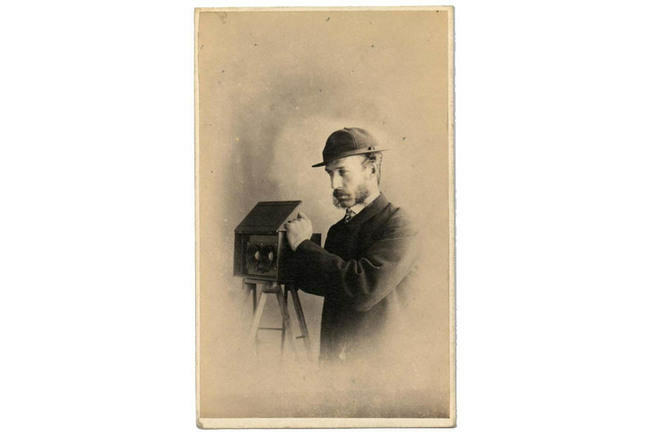 Carte-de-visite depicting a man in a hat with a stereo camera, by an unknown photographer. IL.2003.44.4.270. 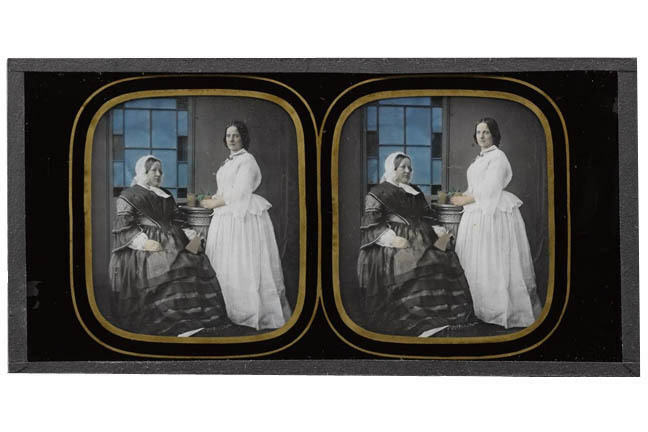 Before the invention of stereo photography, only hand-drawn or printed designs or engravings could be used to create a stereoscopic, 3D effect. Stereo images were created by making two photographs of the same subject, taken from viewpoints approximately the same distance apart as human eyes. Until the 1870s, most stereo images were made from albumen prints, using Fredrick Scott Archer’s 1851 wet collodion process. A glass plate is coated with the wet collodion solution (pyroxylin in alcohol and ether) containing light-sensitive silver salts and exposed whilst the plate is still wet. With its high definition and brief exposure time, good wet collodion negatives could be obtained, from which large numbers of paper positives could be taken. The paper was coated with a layer of egg-white (albumen) containing salt and sensitized with a silver nitrate solution, hence the term ‘albumen print’. 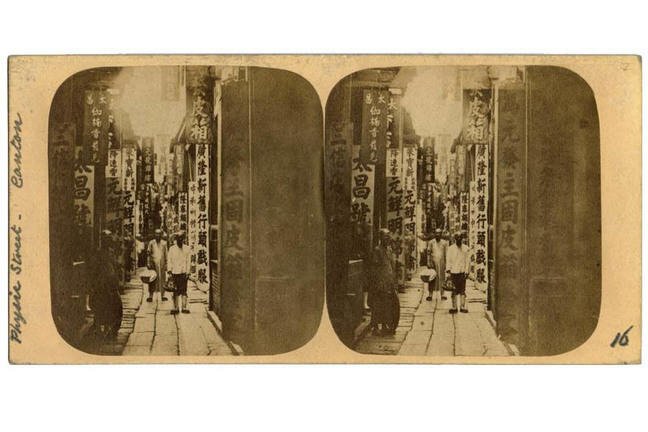 Stereographs were sold at prices between one shilling and sixpence, and 7 shillings and sixpence - equivalent of £6 to £30 or US$10 to US$47 today, depending on the quality of the mount and the photographic process used. This would be similar to the price of a few loaves of bread for the cheapest stereographs, or a week’s worth of meat for the more expensive types. 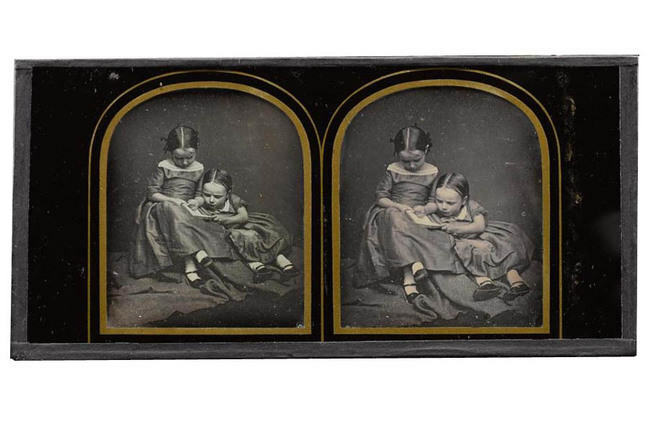 Other types of stereographs produced were stereo daguerreotypes - like this one, above - using the process unveiled in 1839 by Frenchman, Louis Jacques Mandé Daguerre (1787-1851) to create unique images on a silvered copper plate. Stereo ambrotypes like this one, above - were created using Archer’s wet collodion process, but instead of printing from the glass negative, the back of it was either painted black or a black card was placed behind it, to create a positive glass transparency. This has also been hand-tinted to give the impression of colour. Both stereo daguerreotypes and stereo ambrotypes were much more expensive than albumen prints and are thus very rare. Stereoscopic wet-plate camera outfit, single lens, by T. Ottewill and Co., Islington, London, c. 1857. T.1981.20. Image © National Museums Scotland. 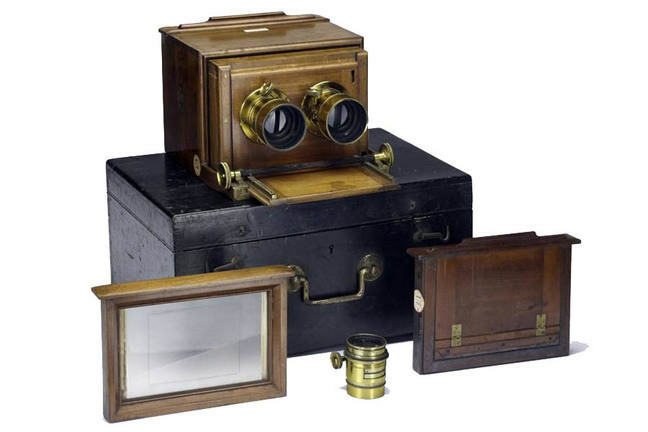 Stereo photographs could be taken using several different types of cameras – the simplest being a single lens camera, which the photographer moved a few inches sideways, or constructed with a sliding mounted lens as illustrated by this wet plate camera, above, of around 1857. The same result could be obtained by carefully positioning two cameras. 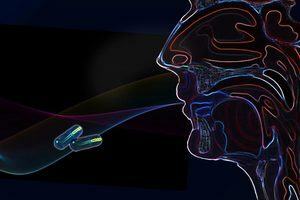 However, two separate exposures were needed, which reduced the accuracy and persuasiveness of the 3D effect. This worked when photographing still lifes or other subjects that would not change or move (for example, buildings) but for more dynamic imagery, including photographing people, it had limitations. Furthermore the camera needed to be kept extremely level for the images to appear stereoscopic in the viewer. 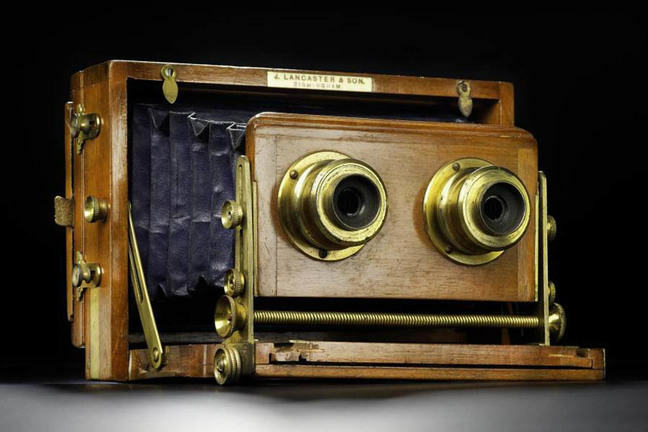 Stereoscopic camera in wood, no. 495, by J.H. Dallmeyer, London, c. 1862. T.1967.176 A. Image © National Museums Scotland. Another method was to use a single camera with two lenses placed side by side, as seen in this 1862 Dallmeyer model above and in the image of the man at the top of this article. Although more expensive, these twin lens or binocular cameras allowed photographers to make simultaneous exposures for more accurate and compelling stereo photographs. As the demand for stereo imagery grew (the London Stereoscopic Company alone had a catalogue of 100,000 travel stereos by 1854) the need for cameras that were more portable increased. 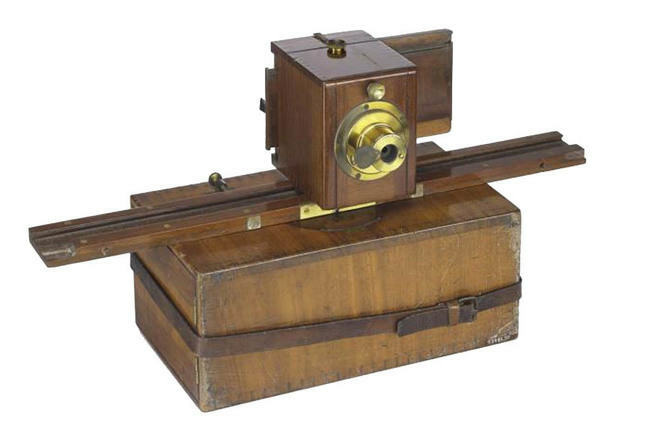 Stereoscopic field camera, with leather bellows, pair of lacquered brass bound lenses, and three mahogany double darkslides, in canvas case, by Lancaster and Son, 1870s. IL.2003.44.10.112. 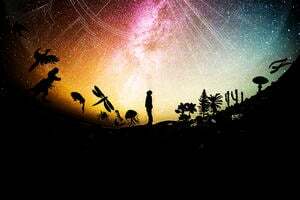 Image © Howarth-Loomes Collection at National Museums Scotland. Field cameras that could be folded to a compact size (see above) enabled the making of stereos outdoors and in previously inaccessible places, both at home and abroad. 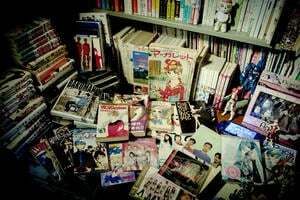 This led to “armchair travel” - photographs from around the world, that could be enjoyed at one’s leisure at home.